A man has been found guilty of preparing for acts of terrorism after chatting online with a covert police officer. 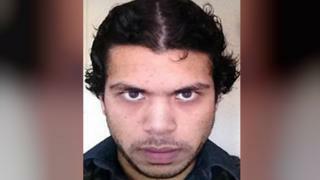 The Old Bailey heard how Luton man Mubashir Jamil, 22, offered to wear a suicide vest and "press the button". The jury heard he wanted to join the so-called Islamic State group (IS) to rid himself of "evil spirits". After being found guilty on Thursday, he was told he would be sentenced next month. The court heard the former Challney High School for Boys pupil, who had denied preparing for acts of terrorism, became obsessed with the idea of martyrdom after surfing the internet for IS propaganda. However, he was caught after talking to an undercover officer using encrypted messages on an app. Mr Jamil, who worked in an Amazon warehouse, had offered to put on a suicide vest and "press the button on the same day". He was arrested by counter-terrorist officers a few days before a planned flight to Turkey. The court was told Mr Jamil had planned his trip carefully and "deliberately" changed his appearance. The jury heard how he shaved off his beard following guidance in an online publication on how to be a "secret agent" in a non-Muslim country. Mr Jamil, who was born in Pakistan but brought up in Britain, denies one count of preparing for terrorist acts. Judge Peter Rook told the defendant: "You must understand this is a serious matter and I will be considering whether to pass a custodial sentence in your case of some length or whether I shall be passing a hospital order. "For the moment you will be returned to hospital and be sentenced on the 23 November at this court."